Yes, you are now reading the words of a certified public accountant. Wahoo!!!! On the cusp of 2 years of pain and anguish, I was just about ready to throw in the towel. I cannot describe the weight that’s been lifted off my shoulders. I feel like I can start living my life again without feeling guilty for having fun. To anyone embarking on the CPA journey, don’t ever give up. I spent a few thousands of dollars on the test and study materials and lost hours of my twenties to this God awful test, but it’s all worth it. It really is. I’ve never felt so accomplished before in my life… or so free. It’s a great feeling and I wish any future CPA the best! 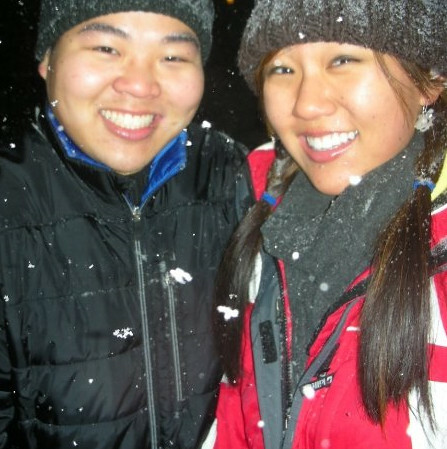 And now back to the blog. I dusted off my Cafe Boulud Cookbook, which really did accumulate a thick layer of dust. I’m sorry Daniel Boulud! Please forgive me. Ray and I have neglected cooking from the Boulud cookbook once we found out Ray was moving to Boston. Our mission statement is now something that’s been in the works, but as you can tell, we do reviews and cook things other than Boulud recipes. Not wanting to turn my back on Boulud completely, I decided to skip through the La Tradition section and move onto Le Potager (or vegetable pot for those non-French speakers). Pretty appropriate for Spring, no? 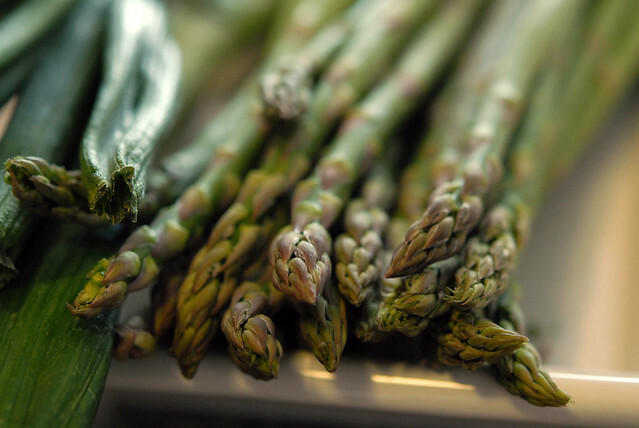 I settled on the Asparagus Tart recipe for some ingredients I was hankering to try — including Vidalia spring bulb onions and ramps. Off I went to my very undependable Whole Foods. I love you Whole Foods, but sometimes you really do let me down. This trip, I had to swap my ramps for garlic and porcinis for cremini mushrooms. One giant score for me for getting the bulb onions. The tart proved to be pretty straightforward. The only real battle was the tart shell. 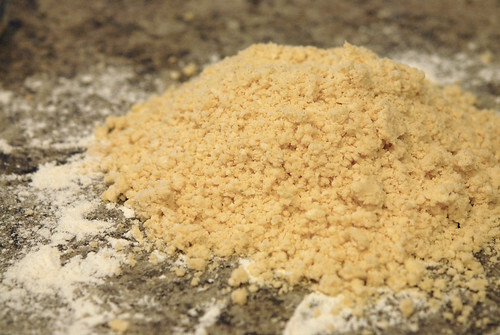 I made a pâte brisée, which calls for flour, chilled buter, salt, and an egg. 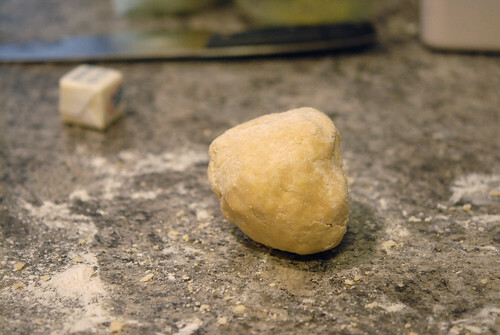 Sounds easy, but I found the texture of the dough was so crumbly that I had a hard time rolling it out without falling apart. See patch work crust below. As you can also see, I did not have the appropriate equipment to make my tart. This is a pretty typical occurrence in my kitchen. I am very gung ho about making something without checking if I have what I need. Whoops. Nothing a little knife work couldn’t solve. Throw that bad boy in the oven at 350 until golden brown and let cool while you prep the rest of the tart ingredients. 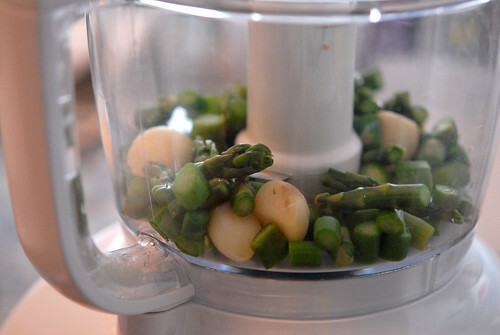 Next step, blanch the asparagus and garlic in salted water. 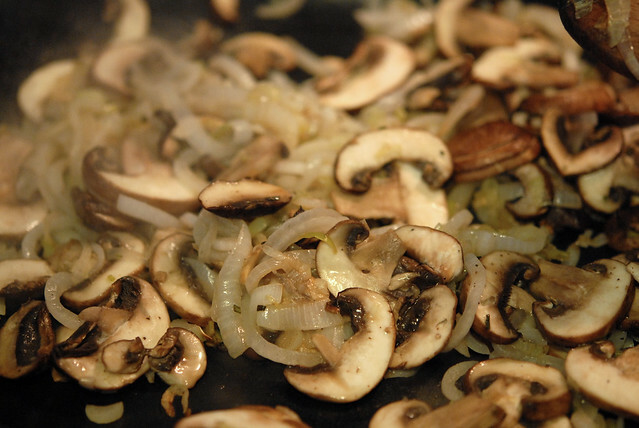 At the same time, saute the spring onions, a few pinches of chopped rosemary, and the cremini mushrooms. Set aside both to cool. 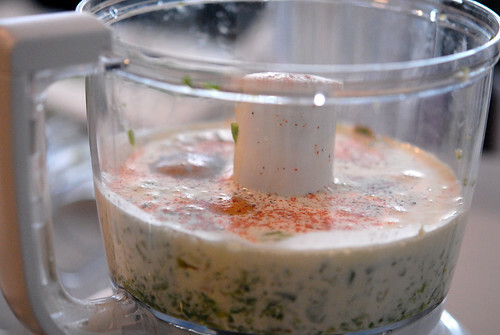 Take half of the asparagus and all of the garlic and throw it in a food processor with eggs, cream, cayenne pepper, and S&P to taste. 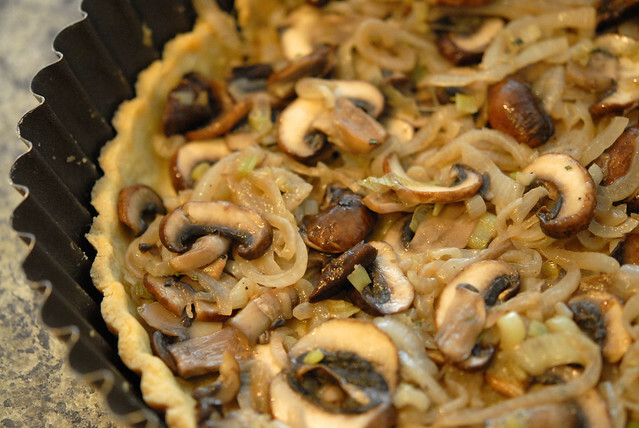 Once the onion mix is cooled down, layer the onions and mushrooms on the bottom of the tart. Then distribute the reserved asparagus on top. 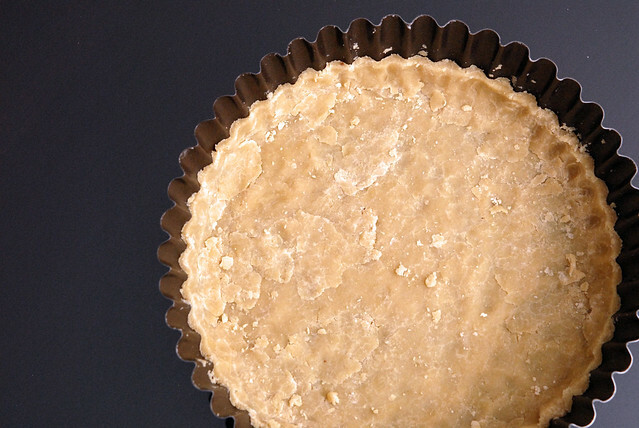 Pour the custard mix into the tart. I decorated my tart with whole blanched asparagus spears in a pinwheel design and topped the tart with a handful of grated parmesan cheese. 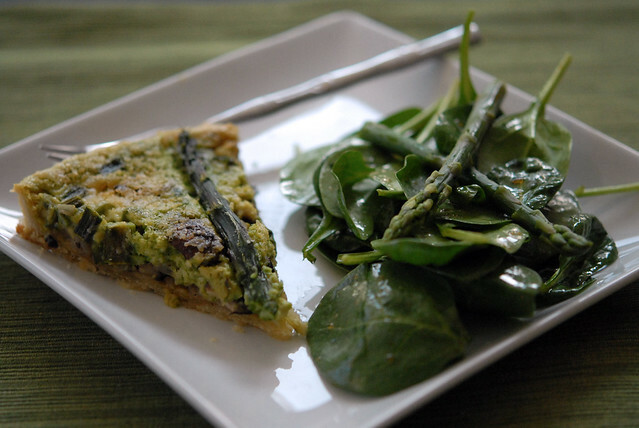 I served the tart with a simple baby spinach and blanched asparagus salad. I took sherry vinegar, almond oil, salt, cracked black pepper, and a pinch of cayenne pepper. Also, this looks absolutely delicious!